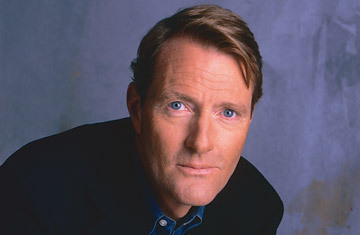 Lee Child had a lucky break when he was 40 years old: he got laid off from his cushy job as a television director with a British TV network. He then had time  lots of time  to try his hand at writing crime thrillers. The result was immediate success. Child, now 52, has become one of hottest thriller writers today, with 14 million copies of his novels in print worldwide, published in nearly 30 languages. Bad Luck and Trouble (Delacorte), the 11th novel starring Child's itinerant hero, Jack Reacher, is currently enjoying a good ride on the New York Times bestsellers list. In the latest book, Reacher is reunited with his elite team of former Army investigators to unravel a brutal conspiracy that is killing off his old buddies. No one travels lighter than Reacher: as the London Telegraph described him, "his only possessions are a folding toothbrush and an unfailing moral compass." Child is a bit more rooted: born in England, he now lives with his American-born wife in New York City, and in a house in France. We recently caught up with Child by phone during his 16-city American tour. CHILD: He's an ex-military cop. Been in the military all his life, man and boy, because of his father also having been in. Now out of the Army and unable to commit to a regular civilian type of life. Just can't settle down, doesn't want a permanent job, so he wanders. Which leads us to the deeper feature of Reacher. He is really this century's version of a traditional archetype, a character who has been there forever: the mysterious stranger. Practically any Western has a homesteader in trouble, and a mysterious rider shows up off the range, solves the problem over two or three days, and then rides off into the sunset. Why is Reacher so rootless? I think it's because having known nothing other than constant moving on and constant unpredictability, he can't contemplate any other way to live. Plus, he's been in the military for so long, and so extensively overseas, that he's never really explored the U.S. So what started out as a temporary enthusiasm, basically to go on vacation and see all of the great sights of the U.S., has now become a compulsion. Got to keep moving and never stop. Do you think a lot of men have that fantasy? Absolutely. I've stumbled across something that is a very strong fantasy actually for both men and women. For men, as they get bogged down with responsibilities, commitments, bureaucracy, it is a fantasy just to think of shedding everything literally, walking away with nothing at all, and just hitting the road. And similarly for women, there's a kind of fantasy that such a man might conceivably knock on her door. Mainly because he wouldn't stick around. In reality, affairs are always messy, because somebody finds out, you get divorced, or whatever. With a fantasy affair, a guy like Reacher might stick around for three or four days, and then you can guarantee you'll never hear from him again. He won't write and he won't call. It's safe and it's perfect. So I think the fantasy works both ways around. Does he always get the girl? Pretty much. He always gets them, but one thing that most people misunderstand is they think that he always then leaves them. But at least half of the time, it is the woman who is intelligent enough to realize that it can't possibly work, so she sends him on his way. What's the impact of him having been a former military officer? I just felt from personal observation that there is nothing more dislocated or alienated than a lifelong military person trying to cope in civilian life. It's like two completely separate planets. Does the adjective "macho" fit? It's a word I don't really care for, because it involves some negative things as well as positive. What I like about Reacher is that he's kind of post-everything; he's post-modern, post-feminist. He takes it absolutely for granted that all people are equally deserving of respect, and also the flip side, that all people are equally deserving of condemnation if necessary. He'll help a woman, he'll kill a woman, whatever. It's all the same to him. You were asked a couple of times to write a James Bond novel, and you declined. Why? You would want to update it obviously, write a James Bond for the 21st century. Which would be very difficult, because James Bond is one of the reasons that the world changed, in a funny way. You'd be writing about the agent of change, and I think that would be very hard to pull off in a way that was intellectually coherent. Tell me about Tom Cruise optioning your book One Shot. Yeah, when One Shot came out, it was temporarily a very hot book in Hollywood. Are they going to do a movie? We just don't know. You can never get a straight answer. Maybe they will and maybe they won't. But if they don't do it soon, then the option will lapse, and there are certainly other people lining up to have a go at it. Pretty much. Reacher is exactly what I would be if I could get away with it.